Last week Barcelona sold their enigmatic Swedish striker Zlatan Ibrahimovic to Milan in a transfer that was astonishing not only because it came just 12 months after “Ibra” had moved to the Camp Nou, but also because the price was considerably lower than the amount the Catalans had paid to Inter for the mercurial forward. Although his performances in the blaugrana shirt had been a bit hit-and-miss, Ibrahimovic was by no means a complete failure, having scored 21 goals in all competitions, averaging a goal every other game in La Liga, where he helped Barcelona retain their title. When rumours first started circulating that Ibrahimovic might be for sale, a deal appeared highly unlikely, especially as Barcelona had apparently inserted an extraordinary €200 million buy-out clause in his contract. Ibrahimovic’s agent, the colourful Mino Raiola, hardly encouraged the transfer initially with a series of negative quotes: “It’s 99.99% certain that Zlatan is staying”; “I have spoken with the club and Guardiola doesn’t want to sell him”; and “Guardiola will leave the Camp Nou before Zlatan does”. "Galliani reaching for his wallet"
So the Rossoneri get to take Ibrahimovic on loan for one year with an option to purchase him for just €24 million at the end of the 2010/11 season. Furthermore, this is a so-called free loan, which means that Milan do not pay Barcelona anything for the loan itself, only having to find the cash to pay Ibrahimovic’s (lower) salary during the year of the loan. During this saga, all sorts of figures have been thrown around, but much of what has been reported is misleading or incorrect, so it’s worth examining this transfer in some detail, in order to understand the different motivations of the interested parties. Put another way, what are the advantages of this deal for Barcelona, Milan and Ibrahimovic himself? This transaction also highlights many financial issues surrounding transfers that fans do not generally understand that well, such as the profit (or, in this case, loss) made from a transfer, a player’s value in a club’s accounts and amortisation. Not exactly thrill a minute stuff, but unfortunately very important in these times when football has become big business. OK, as our old friend Rafa Benitez would no doubt say, let’s try to establish some facts. First, the price that Barcelona paid Inter for Ibrahimovic last year has been listed as anything between €46-50 million plus the value of Cameroon striker Samuel Eto’o who moved in the opposite direction. 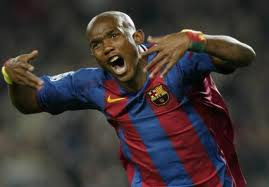 Barcelona’s official website listed the price as €46 million plus Eto’o plus the loan of Alex Hleb, but the Belarus midfielder refused to go to Inter, instead opting to return to Stuttgart, which resulted in the Catalans increasing the cash element as compensation. The figure that we will use for our calculations is the one quoted in Inter’s accounts, namely €69.5 million, which comprises €49.5 million cash plus a €20 million valuation for Eto’o, which we shall round up to €70 million to make life simpler. At this point we need to understand that when the purchase of a player involves a non-cash consideration, such as a player in part-exchange, then the transaction is accounted for using an estimate of the player’s market value. This is obviously open to some manipulation, but not too much, otherwise the value would be questioned by the club’s auditors. In years gone by, football clubs used to book the entire purchase price as an expense in the year of acquisition, which had the advantage of simplicity, but meant that a club’s profits over a number of years could be “lumpy”. However, since the introduction of IFRS (International Financial Reporting Standards), in particular FRS10 on Goodwill and Intangible Assets, clubs have used the capitalisation and amortisation method to account for player transfers. Unfortunately we now need to get a little technical in order to understand the concept of amortisation, which is how accountants reduce the value of assets over time. In this case, we mean footballers. At the end of a player’s contract, the number crunchers consider that a player has no value, as he is allowed to leave the club on a free transfer, so they write down (or amortise) his value over the length of his contract. In the case of Ibrahimovic. Barcelona bought him for €70 million on a five-year contract, so the annual amortisation was €14 million (€70 million divided by 5). After one year his net book value in the accounts was €56 million (the original cost of €70 million less €14 million amortisation). After two years, his value would reduce by another €14 million to stand at €42 million. Simples. There have also been conflicting reports on Ibrahimovic’s salary at Barcelona, but the figure that makes sense to me is €12 million after tax. As he benefited from the Beckham Law, where foreigners were taxed at 24% (instead of a 24-43% range), the club’s gross salary costs would have been around €15 million per annum. This is also consistent with the statement on Barcelona’s website, which referred to savings from the deal of “approximately €60 million”. 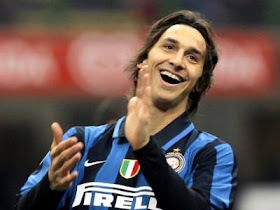 Given that Ibrahimovic had four years remaining on his contract, that equates to annual salary savings of €15 million. Actually, that raises an interesting question: if Ibrahimovic had stayed at Barcelona, how much would this have cost the club in total? Before I give you the answer to that question, I advise you to take a seat. Sitting comfortably? The figure is a jaw dropping €163 million, which is made up of three elements: €70 million to buy the big fella; €75 million in wages (€15 million times five years); and an estimated €19 million in bonus payments. Looking at Barcelona’s accounts, we can see that a very high proportion of their salary costs actually comes from variable compensation, i.e. bonuses paid out for success on the pitch, so I have assumed that this would be 25% of salary (which is possibly on the low side, given the last two seasons). This perfectly demonstrates the importance of wages in any transfer. Last summer, football pundit Jamie Redknapp said, “You can’t get cheaper than a free transfer”, when discussing Michael Owen’s move to Manchester United, but this is obviously nonsense, as it can get pretty expensive if you’re paying the player involved £100,000 a week. Even when the transfer fee is enormous, as was the case with Ibrahimovic, the salaries (and bonus) still represent more than half the total cost to the club. Some might say that part of this cost will be offset by shirt sales, but you need to sell an awful lot of shirts (average profit €12) to make a dent in this. In any case, I would argue that the club would probably have sold a similar amount of shirts if they had bought another world-class forward, but for less money. In reality, Ibrahimovic has of course been sold after only a year, which has so far cost Barcelona €88 million (purchase price €70 million plus a year’s salary €15 million and bonus €4 million). To be fair, Ibrahimovic was bought as a direct replacement for Eto’o, so we should probably bring him into the equation and reduce the cost by the €8 million (or so) wages that Barcelona would have paid to the Cameroon striker, meaning that the net cost should be reduced to €80 million. On the other hand, Barcelona bought David Villa for €40 million this summer, effectively replacing Eto’o after a year’s hiatus with Ibrahimovic, so this should be added, bringing the total cost for the last year to an incredible €120 million. "Raiola - football agent extraordinaire"
Arguably, the cost is even higher, as the money paid to Inter last year enabled them to buy a whole raft of top quality players, who were pivotal in their Champions League triumph, not least when they eliminated Barcelona in the semi finals. In exchange for Ibrahimovic, Inter got Eto’o and €50 million, which they used to buy Wesley Sneijder (€13.5 million), Diego Milito (€22.5 million), Thiago Motta (€9 million) and Lucio (€6 million). You can’t really put a price on a victory like that, but Inter received €49 million from UEFA’s central distribution, compared to Barcelona’s €39 million. That’s €10 million more, so our estimate of Barcelona’s total cost for a year of Ibrahimovic’s services has arrived at a whopping great €130 million. Of course, when Barcelona receive the €24 million from Milan for Ibrahimovic’s sale, this will come down to “only €106 million”, but to lose that much on one deal in one year shows a distinct lack of financial judgment at the very least. To put it more bluntly, it’s staggering incompetence, especially when you consider that the loss is equivalent to more than 25% of Barcelona’s annual turnover. Let’s focus on the sale for a moment. In real terms, the loss on sale is easy to see: Barcelona bought Ibrahimovic for €70 million and will sell him for €24 million, producing a horrible loss of €46 million. Last year many wise football men said the price paid was ridiculous and it looks even more absurd now. However, in the wonderful world of accounting, the loss is a moving target, depending on exactly when you sell the player. It is important to realise that in the accounts, the profit from a sale is not the same as the transfer fee, but is actually equal to the sales proceeds less the carrying value in the books. As we saw earlier, Ibrahimovic’s value in the books falls as time passes with each year’s additional amortisation. So, his value now is €56 million, but in a year’s time it is only €42 million. This means that if Ibrahimovic had been sold now, the loss on sale would have been €32 million (€24 million sales proceeds less €56 million net book value), but next year the loss would be “only” €18 million (€24 million less €42 million). Aha, you cry, so that’s why Barcelona structured the deal as a loan with the sale delayed until next year - a smaller loss. Lovely jubbly. Creative accounting at its finest. Not so fast, big boy. Yes, the pure loss on sale would indeed be €14 million lower, but that ignores the fact that Barcelona still have to book that €14 million as amortisation in the coming year, as the asset remains on their books during the loan. In other words, over two years the accounting loss is exactly the same for Barcelona whether they sell Ibrahimovic now or loan the player and then sell him. If they transfer him now, they make a straight loss of €32 million on the sale. If they go for a year’s loan and then sale, they will lose €18 million on the sale, but also have to book €14 million amortisation, giving a total loss of, guess what, €32 million. (i) Part of the loss is postponed until the following year, so the year-on-year growth will look better in the 2010/11 accounts, which, let’s not forget, are the first ones published under the new Barcelona president, Sandro Rosell. If Ibrahimovic had been sold now, the loss in the accounts would have been €32 million, compared to €33 million expenses in 2009/10 (amortisation €14 million, salary €15 million, bonus €4 million), leading to “growth” of €1 million. However, with the sale slipped by 12 months, the only expense this year is €14 million amortisation, giving a “growth” of €19 million (compared to the €33 million expenses). That will do very nicely with Rosell looking for as large profit as possible in order to demonstrate his financial acumen, which was a key part of his election campaign. (ii) A straight loan would have been too risky. If Ibrahimovic had flopped in Milan, Barcelona would have had to take him back and his value would have further diminished. On top of that, the Beckham Law has now been revoked, so the cost to the club of his salary would need to be increased to cover the higher tax, as his contract has been agreed “netto”. Equally, Ibrahimovic could be a great success, increasing his value, but that would have been too much of a gamble. 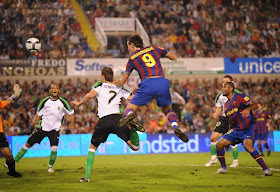 (iii) Ibrahimovic remains as an asset on Barcelona’s balance sheet. Probably not that significant a factor in all honesty, but it helps improve the club’s net assets figure (assets less liabilities), which has been under a great deal of scrutiny with all the talk about Barcelona’s indebtedness. "Shut the door on your way out"
Of course, the argument that Barcelona’s loss would be lower this year might be invalid if a brave auditor decided to ask the club to book an impairment provision against the obvious reduction in the value of the asset. It’s difficult for the club to argue that he’s still worth €42 million in June 2011, when the club has set the price at €24 million the very next month. In that case, they would have to book the full €32 million loss in the 2010/11 accounts. Enough accounting already. However much you dress it up, it’s still a poor deal. In fact, there’s a case for saying that Barcelona will not even get €24 million, as Milan will not pay the whole fee next year, but over the following three years. Given the time value of money, even in these times of low interest rates, that means it is probably only worth around €23 million, once the payments have been discounted. Furthermore, Barcelona will also continue to pay Raiola his annual 10% commission on Ibrahimovic’s salary (€1.2 million a year for four years), as the player did not unilaterally break his contract. The reality is that Barcelona backed themselves into a corner. As Milan appeared to be the only game in town, Barcelona had absolutely no leverage during the negotiations. They really should have tried harder to interest other clubs in the player, so that they could encourage a bidding war, especially Manchester City, the one club that has the riches to pay a much higher price, as we saw with Yaya Toure. City’s absence from the negotiating table seems even stranger when you consider Ibra’s connection to their manager, Roberto Mancini, who had bought him when he was at Inter. 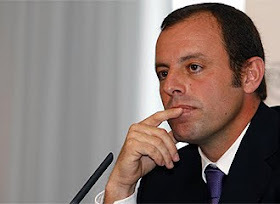 "What does Rosell think of the deal?" In fairness to Barcelona and their new president Rosell, the situation is in some ways reminiscent of the old joke, when an Englishman asks for directions and an Irishman replies, “If I were you, I wouldn’t start from here.” Rosell can also say that it is indeed an expensive mistake, but it’s really Joan Laporta’s expensive mistake, as it was the former president who over-paid. And there are actually some redeeming aspects to this deal from Barcelona’s viewpoint. From a football perspective, they have offloaded a player who did not neatly fit into the team’s fast, flexible passing game and was not really part of Pep Guardiola’s plans for the future. The relationship with the manager had obviously broken down, so if Ibrahimovic had remained, he might have been an unhappy, disruptive influence in the dressing room. In short, Ibrahimovic had become surplus to requirements. As Sporting Director Andoni Zubizarreta explained, “Even with the financial loss, this was the best option.” While it might be good to see the football take priority over money, Zubizarreta also pointed that “the total salaries of the squad have gone down by 5%”, so the financial issues have also been taken into consideration, which is hardly surprising given the hits that Barcelona’s accounts have taken in the last few months. "David Villa - new kid in town"
This was backed-up by vice-president Josep Maria Bartomeu, who claimed, “We’re very pleased with the way things worked out. We’ve saved €60 million and taken in €24 million.” This might well be the truth, but, as we have seen, in no way is it the whole truth. Even if the savings over the next four years are probably higher at €75 million, if you include an estimate for bonuses, the central point remains the same. Incidentally, a few people were under the impression that the €60 million savings mentioned on Barcelona’s website arose from a combination of the €24 million sale plus three years of salary at €12 million, but Bartomeu’s statement gives the lie to that, as it explicitly mentions the €24 million on top of the savings. In addition, as Ibrahimovic was on a five-year contract, four years of salary costs have been saved, not three (Milan pay his wages from this year). Barcelona’s savings in the accounts over the next four years will be even higher, as amortisation is also a factor. With the loan arrangement, Barcelona book amortisation next year, meaning three years will be saved. That would produce another €42 million (3 x €14 million) to add to the €75 million cash savings, resulting in a grand total of €117 million coming off the accounts between 2010 and 2014 (though this will obviously be offset by David Villa’s cost). "The other side of the tracks"
In essence, Barcelona have decided to cut their losses here, observing the economic principle of “sunk costs”, which are costs that have already been incurred in the past and cannot be recovered, so you should move on. No use crying over spilt milk (even if it’s bloody expensive milk). The other point worth making is that Barcelona have produced the majority of their first-team squad from La Masia, their renowned youth academy, so they can afford to make a few costly blunders in the transfer market. This deal in isolation is dreadful, but the club should probably be judged on its overall recruitment policy, including those players developed in-house. For Milan, this looks like a fantastic deal. It’s not just that they have negotiated a cut-price €24 million, but they only have to start making payments next year, when their cash flow will be significantly better, since 11 players’ contracts come to an end, reducing the wage bill by around €70 million a year (though they will obviously have to replace some of these players). Much of the transfer fee will be funded by Milan selling Klaas-Jan Huntelaar to Schalke 04 for €14 million and loaning Marco Borriello to Roma for €2 million (with an option to buy for a further €13 million). Milan have bought “un campione”, as Ibrahimovic has brought success wherever he’s been (seven successive league titles for four different clubs in three different leagues). Along with the purchase of Brazilian striker Robinho, he will bring some much-needed flair to a Milan team that has been toiling in Inter’s shadow the past few years. This will help boost president Silvio Berlusconi’s popularity after he had been severely criticised by fans for his lack of spending. As for Zlatan, he has come out of this affair rather well. He took a 33% pay cut (from €12 million to €8 million) and without this sacrifice, it’s not entirely clear whether the transaction would have gone ahead, as he has effectively subsidised the deal by reducing Milan’s overall costs. OK, the lower wages are still a huge amount of money, but I’m not sure that every player would have done the same. In addition, Barcelona did not pay Ibrahimovic a “golden goodbye”. There had been talk of a huge leaving bonus, presumably to compensate for the salary reduction, but in the end Raiola confirmed that nothing was paid. Cynics may argue that this was possibly influenced by Eto’o losing his court claim for a pay-off equivalent to 15% of his transfer value, but other players might have dug their heels in and refused to budge without a sweetener. Maybe the boy just wants to play. In a remark reminiscent of Eric Cantona, he is reported to have said, “You don’t buy a Ferrari and just leave it in the garage.” He also promised not to leave Milan “until we’ve won everything”, which is a bold statement of intent, albeit one that could prove expensive to his new employers. Hopefully, the magic will return to his game and San Siro will once again witness “Ibracadabra”, for at his best Ibrahimovic is one of the most exciting talents in world football. Actually, you should take into consideration other possibilities for why the deal was made. Especially the possibility of non-tax foreing-to-foreing bank trades to reduce the loss of Barcelona. Or some other not really clean business. It happens more often then we would like to admit. Especially considering Raiola is soon to become part of the official organizational structure of Milan as international agents for the "rossoneri". I can't comment on rumours and innuendo, but with regard to your second point the Internazionale balance sheet for 2008/09 has already been published and this clearly shows that Eto'o was part of the purchase price. Thank you for your insightful analysis of an apparently outlandish deal, but unfortunately my take on the matter goes along the lines of Nero's. 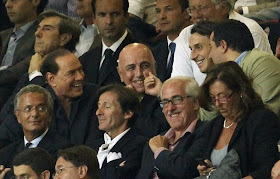 When it comes to murky payment schemes, the track record of AC Milan under the Berlusconi-Galliani management is FAR from immaculate, as it has been well demonstrated by a number of criminal investigations concerning both transfers (like that of Lentini from Turin in the 90's) and players' contracts, with many former Milan stars - including Marco Van Basten - settling on charges of tax evasion. @Swissrambler: I have the 2008/2009 balance (closed june 30th 2009) and eto'o does not figure there (Milito does). Eto'o deal should be included in 2009/2010 balance closed last june and I did not find it yet. Sorry, I should have explained myself better. Eto'o is not yet shown in the 2008/09 balance sheet, as these accounts are up to 30 June 2009 and the Eto'o/Ibrahimovic deal took place the following month. "L'operazione piú importante del mercato estivo si riferisce alla cessione dei diritti del calciatore Zlatan Ibrahimovic al Barcellona per un importo complessivo di €69.500 migliaia con contestuale acquisto dei diritti pluriennali del calciatore Samuel Eto'o, atleta di assoluto valore internazionale con un palmares personale di altissimo livello, valutato €20.000 migliaia." In the file I have, this section is on page 56 of the FC Internazionale Milano S.p.A. Bilancio. Thanks. You're absolutely right. I've corrected that now. @Swissrambler: do you think there can be any logic reason to give up 12 millions euro net in 4 years? Is this the price to pay for not to live in ugly Barcelona anymore? Do you think this is the price to get the honour to play for Mr.President's team? More brilliance. We have many links to it at our page, as we should. Hats off for some amazing work. I'm sure that some cules will drop by and dispute some facts and figures, but you can't. Either way you look at it, it wasn't the best bit of business we've ever done, eh? Unfortunately, we are over a barrel in the transfer market in that clubs know that if we come knocking, we're generally pretty serious about the player, and are (usually) willing to pay top dollar. Then, when we are done with a player, his value is almost never (Toure Yaya being a rare exception) more than we paid. So we release Henry and Marquez on free transfers to dump their salaries. I'm always torn over whether I'd rather be Sevilla, who buys players for a million then sells them to us for 10 but doesn't win championships, or us, who buys players for 70, then sells them for 24, and wins championships. The truth is, as usual, somewhere in the middle. Thanks again for an excellent bit of analysis. 1) Based on the same (Contract Duration)-Amortization-(market value)you rightfully used in your argument to track Ibra's value, it is safe to say that Eto'o's value was far from being 20 Millions. He was in his last -renewed- contract. And after two years on the transfer list no one paid 20 M to get him. So -Financially- he wasnt a 20 M asset. So we have to take that in consediration while calculating "ibra's cost". Especially that -with some man management- Villa would have became the perfect replacement for Henry, not Ibra (and I hope I am wrong when I say Barcelona will realize that too late). Of course, Barcelona's directors will say everything they said to defend the deal. If there was sporting reasons that make it impossible for Ibra to stay then why was he starting most of the games in preseason, Supercup, and Gamper. 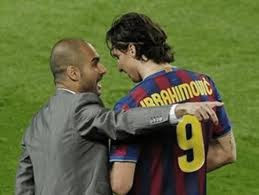 Ibra's comments afterward did Barcelona a favor, while he was trying to play a victim, something he doesnt master. Ibra was an asset in the club. Barcelona was able to sell him for 50 Millions to Man city (how much did they pay for Ballotelli?). And yes, Ibra would have moved there than Milan (forget about what he said afterward). Instead, the club didnt promote a sale and didnt encourage the agent to find a good deal (or the player is staying!). Gamper came as a considerate where Milan made a desperate attempt and were surprised that it worked. A 50 M asset was sold for 24 M that will be begged for three years. And I echoed your statement in an article I wrote on my blog that it is not 24 M but less. Then you have the agent fees which eat a bit more. Maybe, there is another hidden stitch there. New fair play regulations forbid teams to owe each other money from transfers. Milan will come to re-negotiate later and Barcelona will have no chance but to accept. But Sandro was able -again- to make Laporta look bad. That worth the loss I guess. I take your point about the Eto'o valuation. As I said in the article, these can be open to manipulation, but, while I would accept that €20m may be a bit "toppy", I think that equally a valuation of zero would have been too low. On the second issue, a good accountant (or "business partner" in the modern parlance) should not just look at costs. Clearly, expenses are important, but not the only part of the equation. What I really wanted to highlight here was the significance of wages to the overall costs of a transfer. Maybe this is an obvious point, but one that not everybody appreciates. Another excellent article well up to usual standards! Can I suggest another topic for the future - the consequencies for clubs if Sky reduce the money for the next tv contract and / or clubs being allowed to sell rights individually - this could have a huge effect and it could well happen. Thanks. The original Ibra deal also forced Barca to renegotiate Messi's salary so he would remain top-earner at the club, which Laporta decided to accomplish via the characteristically over-the-top gesture of signing him to something like a 10-year contract. So Barca is on the hook for 10s of millions of Euros on that end as well. This really is fantastic stuff. Strikes a fantastic balance between forensic analysis and clear storytelling that us non-numbercrunchers can get our heads around. Thank you. Interesting. One of the reasons why Barcelona's wage bill increased so much last year. By the way, do I take it that you are a fan of The Smiths from your nickname? You should probably correct that. One aspect that has not been brought forward yet -apologies if i missed it- is the issue of the bank warranties the board needs to provide in line with the profits or losses of the season. Many argue this is why the operation was engineered this way, so the board can get rid of this requirement next summer after showing through-the-roof profits. Great blog and comments folks. "Oh, one other thing. A mistake: I misunderstood something I was told. It was Zlatan who apprently said that, not Raiola." The comment is towards the end, timed at 12:13 PM on 31 August. This issue was specifically raised by one of Joan Laporta's former deputies, Xavier Sala i Martin, but I have no way of knowing whether this is true. Well, when it comes to Barça, keep in mind the board has ultimate goals well beyond Barça's success. They may be political, strategical, sometimes even 'racial', you know, the 400 families ruling the province/(country?). We are yet to see a president who legitimately puts FCB's interests ahead of his own. That position is far more powerful than any other in the province/(country?) of Catalunya. It is extremely complex, but if one thing is for sure is that there is a hidden agenda. Sala-i-Martin's was not too thick, mostly ego related, but still bad enough. And he sheltered the irregular transactions of Laporta, so he is equally responsible. Too bad FCB never had the management they deserve, neither they ever will. Great post mate, apart from the technical details of the transfer I find it especially nice (from a Swedish viewpoint) to see a Brit recognize what a special player Ibrahimovic actually is. First rate piece. There seems to have been an unusually high number of loan deals this transfer window (just my impression, no numbers to back that up) and I had been wondering about the economics of it all. Thanks for walking us through this example with such clarity. I, too, share the doubts of those who find it hard to believe that Ibrahimovic would take a one-third cut in net pay without some offsetting payments (an offshore signing bonus, perhaps?). Even more so, I find it equally difficult to believe that Raiola would take the matching hit to his commission income. Wonderful article. thank you very much! I'm an Ibra-fanboy, and I'm pretty sure he just wants to play football and have fun. It will be interesting to watch Milan this year. My prediction. Milan wins Serie A and CL this season. Next summer Ibra is re-united with Mourinho in Madrid. I'm an economics student and a big footballfan and I just found your blog. I have to say, brilliant, just brilliant! You are welcome back to Sweden any time mate! No, he did not tell me. Actually, I would have preferred if he had ASKED me whether I minded my entire article being posted on another blog, even if it has been translated. I consider that bad manners at the very least. Great article. I just want to point out a minor detail in this. AS Roma claims the loan of Boriello is for free and the transfer fee is €10m (http://bo.asroma.it/UserFiles/1225.pdf). Thanks. Your figure must be correct, as it comes from an official source. Swiss Rambler: sorry, i thought he had written you. And I thought he meant it to be somewhat complimentary to translate (for free) the article and distribute it widely along with the link to your blog. So don't be too harsh. On the other(and more important) hand, thank you for writing one of the most interesting football blogs around. No, he did not write to me. While I am flattered and might even have agreed to a polite request for translation, the reality is that when an article is reposted in its entirety, nobody bothers to click on a link to the original site. My software tells me how many page views I get from referring sites. Have a guess how many people clicked on the Swiss Ramble link from his blog today? That's right, none. sorry, we have only translate your wonderful post and we insert direct link to your blog (and we have increase your users, i don't know if you are interested...). we are only a blog. we don't re-publish your post for economic purpose. i wrote 3000 post in these years and many other blogs,journalists have re-publish my posts without my permission (and often without link). if you don't want that your posts are translated in other language, we understand. Swiss: i know how referrer works, thanks. But I can tell for sure that in the past days a lot of people came fromt that blog since your articles were posted in the comments. I came here for that reason for example. And the good side of having a link on a very popular blog is more than just direct access from that blog. Anyway, it's not about who "gains" from the exchange. I think that good journalism (or however you want to call your articles) should spread as much as possible. Because there is so little good in-depth discussions around. So, my hope is that this ends up in you two clearing things out. I for one subscribed to your rss feed on google reader.. I can assure you that the many english reading followers of said blog are now loyal followers of this very website. Fair enough. I am kind of pleased that you thought it worth translating my article and you were good enough to inform me. The only issue I have is that I would have preferred it if somebody had asked me in advance before re-posting the article, which I'm sure you understand. We had a good exchange earlier, so I know that you are one of the good guys. I also like the ISCM blog: some well-written articles and a good, healthy debate in the comments. I lived in Milan for 3 years, so I understand Italian. I may well have over-reacted earlier, but I've seen so many of my articles posted elsewhere with no links. As someone whose work has been re-published without permission, I am sure that you understand that I would have preferred being asked in advance. That's my only issue. Having said that, I am flattered that someone went to all the effort to translate my article, especially as it's on ISCM, which is a fine blog with well-written articles and good comments. Hi rambler, I have to confirm that I've never heard about this blog before reading the translation of your wonderful post on ISCM today in the morning. Anyway, after that, I came here directly and read the post about Inter's financial situation... and appreciate it very very much (I can understand written english quite well, even if my own is awful :-))). I guess that your "irritation" might be understood as you thought that some1 was "scrounging" your job for his own aims, but I can assure you that Simone Nicoletti and others ISCM's bloggers are always very very polite and "intellectually honest" (do you remeber Josè Mourinho's fight about this matter??? ); in fact the link to this site was posted very very clearly at the beginning of its translation. So don't be bothered about that; since today, thanks to ISCM, your blog has (at least) one more reader (but I guess they are many many more...). Best regards and keep going on with your excellent work. ps: sorry for my english. Dear Swiss Ramble, allow me just to drop a few lines to say THANK YOU. The pedagogical style in which you write your fun to read, amazingly researched articles makes the whole experience just sound like poetry.Needless to say, the added benefit of being free of charge, makes one wonder if there is any point in buying any sports related newspaper, considering the much lower quality of their writtings. Once again, Thank you. Wow what an epic article! I didn't understand half of it, but I get the gist. Turns out whatever way you look at it, Barca wasted a lot of money. At least you mention that the player was not actually a flop, it was just bad business. Wonder how he'll do with the other workaholics in Milan's front line, Robinho and Ronaldinho. As good as they are it does have the air of 'reject united' about it... Similar to City and their signings of Adebayor, Toure (Kolo) and Bridge. None of their old teams seemed too sorry to lt them go, and none of them are City's best players now. The young stars like De Jong, Kompany and A Johnson are the ones that could win them the league - so they may as well stop wasting money in buying 'top' players from big teams, as they only ever sell ones they think can no longer cut it (or even never could). Hope I'm not breaking any rules in leaving my site address here? I'm new to this. I enjoy your analyses though you do omit the effects of corporate tax on the clubs in question. This can have a significant effect in post tax terms as well as the cash flow effect dependent on when tax payments are due. For example, what are the taxation allowances for player amortisation in Spain and italy ? Are they the same? Not a problem if you link your site. I don't usually include tax in my analysis, as it is rarely significant for football clubs, mainly because they usually make losses. Even when a club makes a profit, tax is not that big a factor, e.g. Barcelona's revenue in 2008/09 was €366m, their expenses €361m, while the tax was only €2m. You're right that sometimes there is an issue in terms of tax payments. If that is the case, I would mention it in the analysis on debt or indeed cash flow. Thanks for your reply. I take your point that not many clubs make a profit. Nevertheless, if there was a difference between taxation allowances in respect of player amortisation it could be a factor in the timing and arrangement of transfers. An analysis that is crying out to be made now, in advance of the introduction of the new UEFA financial rules, concerns how clubs could get around them. I have not seen the details but it does occur to me that one avenue could be the ramping up of income through transactions that are not altogether at arms length. For example, supposing a certain Russian billionaire wanted to increase his club's revenue, is there anything to stop him getting one of his oil companies to pay vast amounts for shirt sponsorship? Indeed, the possiblities for both sides of the profit and loss account to be manipulated could be interesting so long as the companies concerned are not part of the same corporate group. AC Milan also springs to mind. Alternatively, is there anything to stop a club's share capital being increased regularly to ensure solvency? Barring, of course, the taxation cost, stamp duty? In short, UEFA are not complete idiots and have specifically included clauses that should ensure that clubs apply market values for items such as shirt sponsorship, executive boxes, etc. It's similar to how the IRS looks at inter-company transactions. Obviously, there is still some scope for manipulation, but the most blatant excesses should be prevented. Share capital can be increased, but there will be a restriction on how much can be used to fund losses, as the regulations focus more on a club's ability to break-even in the P&L, as opposed to debt levels. Of course, clubs can employ an army of accountants to try to get around the new regulations, but football's a simple business and it would be relatively easy to identify any such attempts. I would certainly like to analyse more Italian clubs, including Juventus. Got a lot on my plate at the moment, but I hope to organise a review some time in the future. Thanks for the reply , I enjoy reading your articles though i sometimes get lost when you start talking about what accountants do, slowly starting to understand that stuff after reading more of your articles. thank you for this extremely insightful blog. I am amazed at your ability to explain finance and accounting in layman's terms and I just wished that your kind of sports/financial journalism was more spread throughout today's mass-media. Where does insurance sit on the books? I’ve always assumed the club insures players against injury. I remember a dispute between Chelsea and Roberto Di Matteo. Chelsea claimed on the insurance, but Di Matteo wanted to play again either he had to buy out his Chelsea contract or wait till his contract ended. An auditor would want the full length of the contract to be insured rather than it being renewed each year. You don’t want to be in the situation where a player has a serious injury and the insurance is due to be renewed. The insurance contract could be constructed such that it is terminated if the player is sold, then the insurance cost could be amortized in the same way as the transfer fee. If it is a one off payment then it has to be accounted for as income. In the context of a transfer fee the insurance may be small, but as many as one in twenty players have their careers ended by injury. I have never seen contract insurance disclosed on club’s accounts. Firsty, i would like to thank you for your great blog. I'm a die hard Juve fan and a writer in football websites in israel (& also with Economics Background)and Enjoying the combinations of Football and the economic side of the game. Secondly, I've translated your article about Juve finance to the israeli croud (will come up soon, Email me to Idanwall@gmail.com if you want me to send you the link) and then went on to read other articels , namely the Zlatan one. I have a question for you about the Issue of amortisation. in your article you claimed the club accounts use the Straight line (linear) amortisation method to asses the value of a player over time and i thought to my self- will the same method be used for young and old players ? If we'll take Juan Mata (age 21), a young lad with tons of potential, Would Valencia decrease his value from the current assesment ( let's say - 20 million) or try to "guess" his price in the next few years and base the reduction on this ? And in addition - do you think amortisation methods like Declining balance or Increasing balance are being used ? All the clubs that I have analysed use the straight-line amortisation method. It has the advantage of being simple and taking the guesswork out of valuations, though it often under-values the asset (player). A Brit who has been living in Switzerland for many years, having found (and married) a Swiss Miss. During his globetrotting career in the world of finance, he has also lived in Italy and Sweden.